The ship is due to be scuttled later this month midway between Hervey Bay and Bundaberg in south-east Queensland and dive operators are expected to begin tours within months, once safety checks on the ship and moorings have been completed. 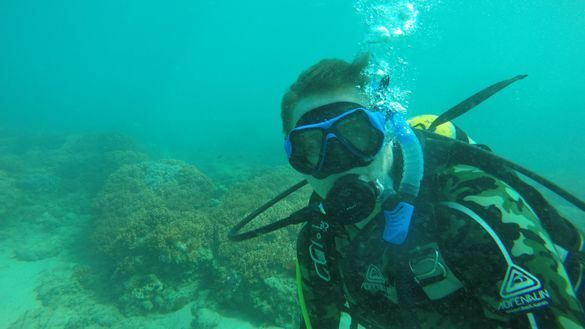 Fraser Coast Tourism & Events marketing and communications manager Bradley Nardi said Hervey Bay Dive Centre and Dive Hervey Bay were the Fraser Coast operators chosen by the State Government to conduct recreational diving activities on the ex-navy ship. He said a highlight of diving on the 127m-long wreck would be swimming through the tank deck which ran almost the entire length of the ship. “This unique dive site will attract visitors from around the world and spawn a new tourist industry worth between $2 million and $4 million annually to the region,” Mr Nardi said. “The upper rear decks of the ship will be in water shallower than 18m, appealing to open water divers and snorkellers. Hervey Bay Dive Centre director Ed Gibson said he took a gamble in starting his business two-and-a-half years ago when he heard the ex-HMAS Tobruk might be coming to Hervey Bay. While waiting for the ship to be scuttled, his company has been taking clients swimming with whales, on reef and beach tours to Big Woody and Fraser islands and operating as an on-call water taxi. Mr Gibson’s calculated risk paid off in April when the company’s application for commercial dive access to the ex-HMAS Tobruk – the Royal Australian Navy’s first purpose-built heavy lift ship – succeeded. “It’s an awesome wreck,” he said. “It’s unique in so many ways. “Where they used to have the tanks, we’ve got this massive cave underwater. The ship, which has two helicopter decks, could transport up to 18 tanks, 40 armoured vehicles or personnel carriers and up to 520 troops while in service. The certified PADI dive centre’s 12m Kevlacat, powered by twin 250-horsepower outboard motors, will take up to 10 customers and two master divers out to the ex-HMAS Tobruk. Mr Gibson said fly-dive-explore packages including accommodation close to the harbour and Fraser Island day trips would be available to interstate divers. “It’s about people leaving the region saying they’ve had a really good experience,” he said. Dive Hervey Bay owner Glenn Bowman is a dive instructor with more than 35 years of experience and has trained more than 3500 divers. He’s also a retired paramedic and holds a host of other qualifications including diver medical technician. “I’ll be training my staff to a high level,” Mr Bowman said. He said he could take a maximum of 20 people out to the wreck but expected to average about 10 divers plus a guide each trip. “It’s going to be a real drawcard for the region,” he said. Mr Bowman said he expected the ex-HMAS Tobruk would be a must-do for international visitors as part of an east coast dive holiday. He has entered an agreement with tour operator Spirit of Hervey Bay which will provide the vessel for his dive operation. Spirit of Hervey Bay manager Bobbi Hayter said speed and comfort were their main considerations in supplying a vessel for the scuba divers. “They’ll want to get to the site as quickly as possible and to be able to relax and rest with ease between dives,” she said. Mr Bowman said snorkellers would be able to swim over the ex-HMAS Tobruk but he expected the vast majority of his passengers would be scuba divers. He said some divers would also be interested in checking out the varied fish and sea life on the Roy Rufus and Simpson artificial reefs in the Great Sandy Strait. Both of the dive companies offer courses for those wanting to gain the necessary qualifications to dive on the ex-HMAS Tobruk. Mr Nardi said the number of divers permitted on the wreck at one time was limited and private divers would be able to book two-hour time slots to explore the site via visitfrasercoast.com.au. For more information on dive tours, visit diveherveybay.com.au or scubadiveherveybay.com. Ex-HMAS Tobruk, with the motto Faithful and Strong, was launched on March 1, 1980 by Lady Anne Cowan and was the Royal Australian Navy’s first purpose-built amphibious heavy lift ship. She could transport up to 18 tanks in the tank deck, more than 40 Light Armoured Vehicles or Armoured Personnel Carriers on the vehicle deck and provide accommodation for up to 520 troops. HMAS Tobruk was decommissioned on July 31, 2015 and is due to be scuttled in June, 2018.